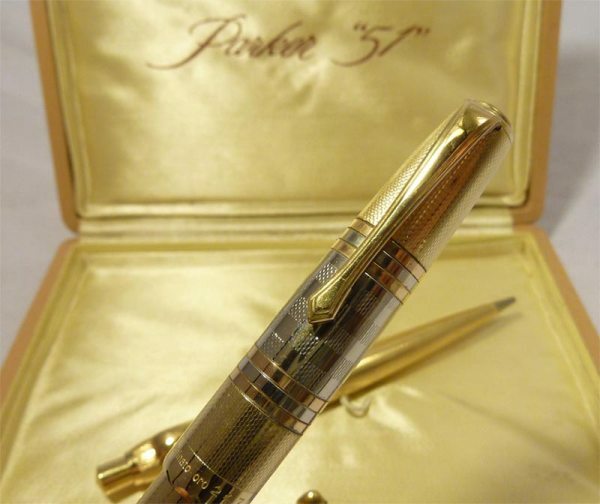 These are New Pen Site Updates of the latest items that have to do with the Parker Pen Company. They are not all necessarily related to the Parker “51”, but should be of interest to the collector. I will eventually move the items to the different pages of the site. 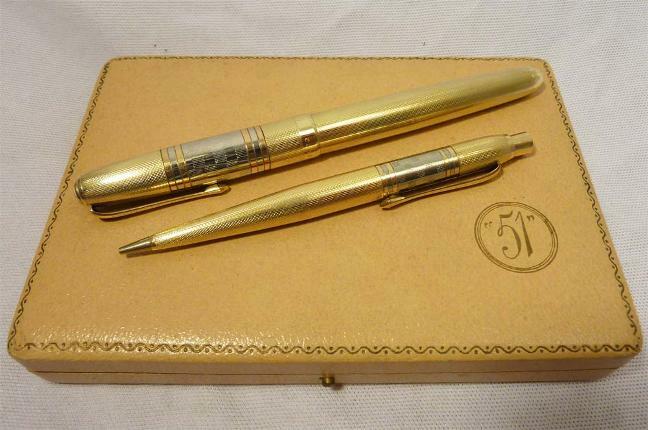 A pre-production circa 1940 Parker “51” set recently found “in the wild” in Washington state. Cordovan with smooth gold filled caps, brushed finished with polished bands. Caps are perfect, with nearly 100% of original finish and just some tarnish on pen cap lip. Both caps are imprinted at top with aluminum jewels. Sharply imprinted on blindcap, but with no date code. 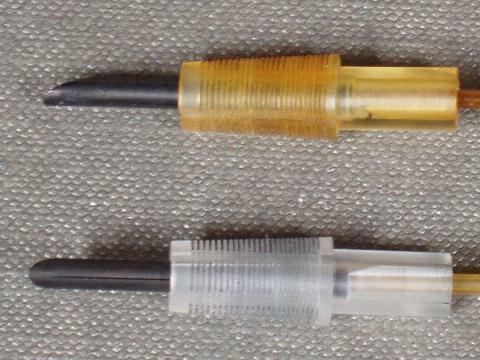 Cap on pen has the early 4-window long clutch. A very early near mint circa 1941 Parker “51” “first year” set recently found “in the wild” in California. Green barrels, perfectly matched in colors, most likely made of the same lucite material. Early pencil with no gripping lines. Caps are the rare “watermelon” pattern in pink and yellow gold with raised polished gold filled bands. Caps are perfect except for some tarnish under the pen clip, with 100% of original finish. Sharp 1st quarter 1941 imprint and aluminum jewels. A near mint circa 1944 Parker “51” “Coronet” solid 14k yellow and pink gold set recently found “in the wild” in southern Illinois. Probably the rarest 51 pattern out there. Very few sets have been found in this stunning pattern. Set is as found, with single jewel pen barrel. A very rare, all original 1943 Parker “51” in hand hammered Sterling Silver recently found “in the wild” in Ohio. Not cataloged by Parker and often reproduced, it is a very hard cap to find and identify for the novice collector. 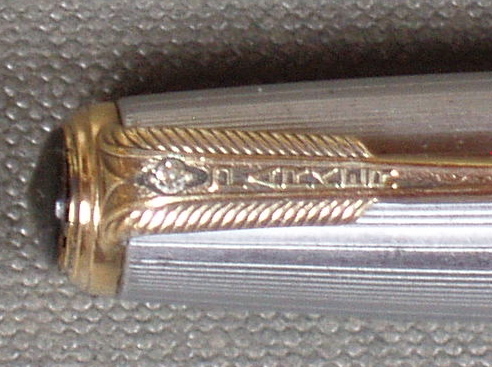 A circa 1950s Parker “51” Italian-made Jeweler’s overlay. 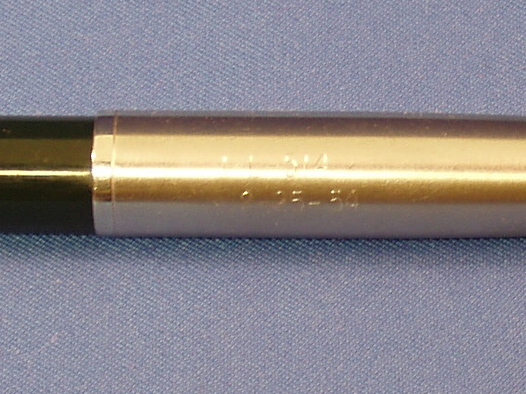 Only markings are Laminato Oro (gold filled) and a serial “2472”. High quality pen over US-made components. Last year I was able to locate the above Parker “51” first year pen. It is unique in that it is not Buckskin but a Mauve color with black specks, giving it a granite look. No, it is not discolored as the color is nice and even throughout, even under the cap. To my surprise, a collector brought to my attention the above pencil, as he thought the color was strange. Guess what? It is a perfect match colorwise, and even has the same black specks! This pen came from the holdings of a retired Parker employee. It does not appear to be Parker production as the nib is marked “Delta”, but it is interesting that Parker was seriously looking at what other competitors were doing for fillers or maybe at how close the were copying the “51”.